Finland provides a positive example of what can be done to end long-term homelessness. IN THE 1980s, close to 20,000 people were homeless in Finland. Today that number is closer to 7,000. The northern European country has long been at the forefront of efforts to eradicate homelessness, offering innovative solutions to the seemingly intractable problem. It cut the number of homeless people in the country in half between 1987 and 1996. But by 2003, however, the decline in the homelessness population had slowed down significantly, with the number hovering around the 8,000 mark. The consensus was that the homeless who had been easier to house had been housed, leaving behind the long-term homeless. This cohort of people made up about 40% of the homeless population in 2008. Typically they would have had a myriad of social and health problems and require a lot of care. Enter the housing first programme, which was rolled out across 10 cities in Finland in 2008 (an 11th city was later added). The purpose of the programme (which we’ve covered in Ireland before) is to give homeless people a home first, and to provide care plans and support after. The primary goal being to actually give someone a home to call their own. Care plans, therapy, support or whatever else was needed could come after this. It has been the centre of the Finnish government’s policy towards ending homelessness since 2008. And it’s working. “Our goal was to first half and then end homelessness entirely,” says Juha Kaakinen, CEO of the Y-Foundation, the organisation which has spearheaded the housing first programme in Finland. We didn’t quite end it, but there has been a significant reduction in long-term homelessness. Long-term homelessness has now decreased by 30% since the programme began, while the number of homeless people continues to steadily decline. Perhaps the most striking element of Finland’s approach from an Irish perspective was the complete renovation of all homeless emergency accommodation and shelters into actual homes. “So there are only independent flats,” says Kaakinen. “There can be onsite personnel but the flats are totally independent so you can have a rental contract and you can live there on your own,” he says. Latest figures for Ireland show 4,643 homeless adults living in homeless emergency accommodation across the country in December (3,162 of these in Dublin). Three new homeless hostels opened in Dublin over the Christmas period, with the general emergency response each winter being the opening of more beds. “To solve homelessness you need to aim to have permanent solutions not temporary solutions like hostels and shelters,” says Kaakinen. Taking Helsinki as an example, he points to one of the largest emergency shelters that used to be there. “The last big hostel we had in Helsinki which was run by the Salvation Army had 250 bed places. In 2011 it was closed and renovated into supported housing units and now it has 80 independent apartments and onsite personnel. One hostel with 52 temporary beds remains open in Helsinki in case of extreme emergencies, but other than that Kaakinen says they are now all homes. On top of this, other results point to the ongoing success of Finland’s housing first programme. Rough sleeping has all but been eradicated in the country since the programme began, down from a number of several hundred in 2008. “We have virtually no street homeless people in Finland and that’s probably the greatest achievement of this programme,” says Kaakinen. All this was achieved through an ambitious, state-sponsored programme of renovating emergency shelters, building new houses and acquiring other homes through the private rental sector. This has resulted in around 3,000 new homes brought onstream specifically for homeless people since 2008. A lot of the funding for the programme comes from the Slot Machine Association, which provides money for builds and acquisitions from gambling funds. The rest comes from government loans and grants. Government support and financing has been integral to the programme’s success. Can it be done in Ireland? 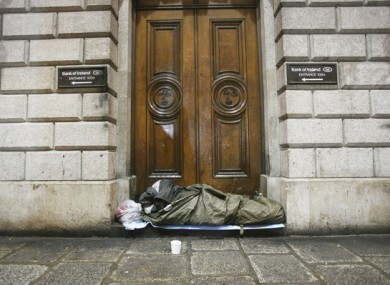 The Irish government’s current Housing Action Plan towards ending homelessness was launched last year. While it was welcomed for its commitment to deliver 47,000 new social housing units by the end of 2021, the plan was criticised by homelessness charities and opposition politicians for its over-reliance on the private sector. Details on how many new social housing units would be actually built were lacking from the plan, with the focus being on the housing assistance payment (HAP) and leasing schemes as means of housing people. “When you try to solve homelessness, you need to realise that you have to build,” says Kaakinen. You need to have more housing. Focus Ireland and the PMV Trust are currently running a housing first programme in the Dublin area, which is funded by the Dublin regional Homeless Executive. The Housing First building in Temple Bar. This programme is showing strong successes in providing homes for long-term rough sleepers, but members say it’s being slowed down due to a lack of proper housing supply. Meanwhile, converting all of Dublin’s emergency accommodation into homes would be a radical solution to the problem, but the government have given no indication that this is a course of action they would follow. There is also a chance of public opposition if the people resident in emergency shelters feel they are not being provided with suitable alternatives, as was seen with the occupation of St John’s Lane West last summer. “The key issue is the political will,” says Kaakinen. That you understand that this is a problem that concerns human dignity and it can be solved. But you need to have a long-term plan. Email “Want to end homelessness? How about converting every emergency hostel in Ireland into a home”. Feedback on “Want to end homelessness? How about converting every emergency hostel in Ireland into a home”.